BRIGHTON Mich. June 6, 2012 – Getting your drivers license can be a very exciting experience for teens but can also be quite stressful for parents. The GDL (Graduated Drivers License) is a trend that is spreading, one where states put restrictions on novice drivers in a bid to reduce accidents and lower death rates. An analysis conducted by the Insurance Institute for Highway Safety and the Highway Loss Data Institute has found that if every state adopted all five components of the toughest driving laws in the nation, then more than 9,500 collisions could be averted, saving at least 500 teen lives annually. 1. Permit age of 16 – There are 8 states and the District of Colombia that have a minimum age requirement of 16 to get a learners permit. In Alaska teens only have to be 14 years old to obtain a learners permit. In Michigan teens can begin drivers education at 14 years and 8 months and will have to demonstrate supervised driving experience before moving onto segment 2 of driver education. Michigan teens must complete 50 hours of supervised driving. 2. Practice hours – The majority of the states require a set number of practice hours before a teen driver can get their license. Pennsylvania has the most required amount with a minimum of 65 hours. 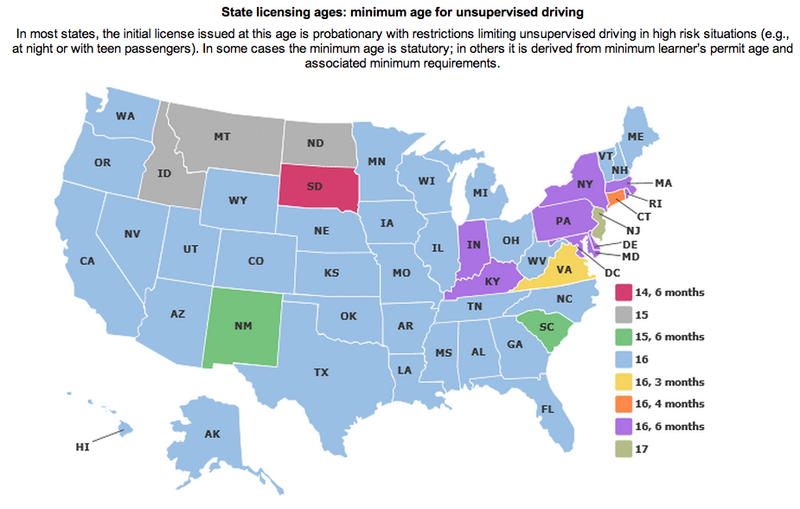 Some states like South Dakota, New Jersey, and Arkansas have no minimum supervised driving requirement. In Michigan teens must practice at least 50 hours of supervised driving and at least ten of those hours must be driven at night. 3. License age – In South Dakota teens that are 14 years and 3 months old can obtain their license if they have completed driver education. In states such as Idaho, Montana and North Dakota teens can get a license at 15 years old, but New Jersey teens won’t be getting behind the wheel by themselves until they are 17. Michigan falls in with the majority of the country with an age requirement of 16 years old and completion of driver education and a driving skills test. 4. Night Driving – Most states have restrictions on night driving for teen drivers. In states like Connecticut and Arkansas teens cannot drive at night until their 18th birthday. South Carolina teens can only drive until 6:00 PM. Michigan teens are restricted from driving between the hours of 10:00 PM and 5:00 AM. In general Michigan GDL requirements are above the average standards compared to the rest of the states. Teen drivers should remember, getting your license is a privilege and something to be proud of but it also comes with a tremendous amount of responsibility. Parents, share this article with your teen and our other Teen Driving Tips articles to help them stay safe behind the wheel. A driver's license is a great deal amount of responsibility. These driving tips are great too. I didn't know Michigan had this great thing about driver education.